BasX TA-100 stereo preamp/DAC/tuner with integrated amplifier features numerous connectivity options for all your sources and is available with or without Bluetooth functionality. - Maximum output level: 4 VRMS. - Freq resp (MM/MC): 20Hz-kHz, RIAA curve. - Dimensions: (WHD): 17" x 2.63" x 12.5"
Emotiva BasX TA-100 Integrated Amplifier combines the features and capabilities of an audiophile quality stereo preamplifier, a high-performance FM tuner, and a high-quality power amplifier – all in one convenient package. The preamp section includes line-level analogue inputs for a CD player or line-level source, a built-in USB DAC with plenty of digital inputs for your computer and other digital stereo sources, a high-quality phono preamp that supports both moving-magnet and moving coil cartridges, and provisions for an optional high-quality AptX Bluetooth input module. The tuner offers full digital control, and 50 station presets. The fully complementary, all discrete Class A/B amplifier section delivers plenty of clean power to drive a pair of high-quality stereo speakers to satisfying listening levels; and the TA-100 includes line level outputs for a powered subwoofer, or for connecting an external power amplifier. The TA-100 can be operated via the simple front panel controls, or by the included infrared remote control. The intuitive menu system makes the TA-100 simple to configure and operate, and the big, easy to read, VFD display on the TA-100’s front panel shows you exactly what’s going on at all times. The BasX TA-100 offers the type of performance you might expect to find on expensive components costing many times its modest price. Unlike many other affordable audio components these days, the TA-100 delivers the superb sound and build quality you expect from a true high-end audiophile component. It has vanishingly low noise and distortion and features a wide-bandwidth design allowing you to get the most out of your HD sources. Don’t be fooled by the conservative power ratings. Unlike the 'throw-away' amplifiers you get in many low-powered receivers, the beefy fully complementary, all-discrete power amplifiers in the TA-100 have plenty of power reserves to drive all but the most inefficient speakers. 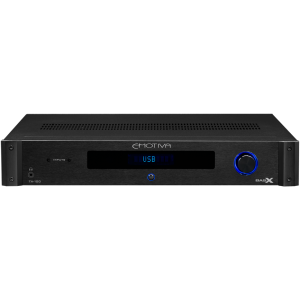 Like all Emotiva amplifiers, they work very well with both 8 Ohm and 4 Ohm speakers. The BasX TA-100 is built to last, with a heavy-duty steel chassis, solid milled aluminium faceplate, and high-quality parts and construction so you enjoy your BasX TA-100 for a long time. The goal of putting together an exceptional audio system is to enrich your life with outstanding sound. It’s all about playing the music. It isn’t about spending a lot of money, or solid gold knobs or jewel-encrusted remote controls. And you don’t need all sorts of complicated features you’re never going to use. The key to building a great audio system is to use well-designed components with excellent technical performance and superb sound quality. Every Emotiva BasX component has been designed from the ground up to be part of an excellent audio system. They incorporate the latest cutting-edge technology and all the features you need to give you the best possible listening experience. This unique combination offers a combination you just can’t find anywhere else – great sound and great value. All of the components in the new BasX line are priced to be within reach of every music lover. You don’t need to be rich to afford them, and you don’t need to be an engineer to figure out how to use them. They’re carefully crafted to give you many years of reliable and trouble-free service, and they’ll look great in your living room or on your audio rack. 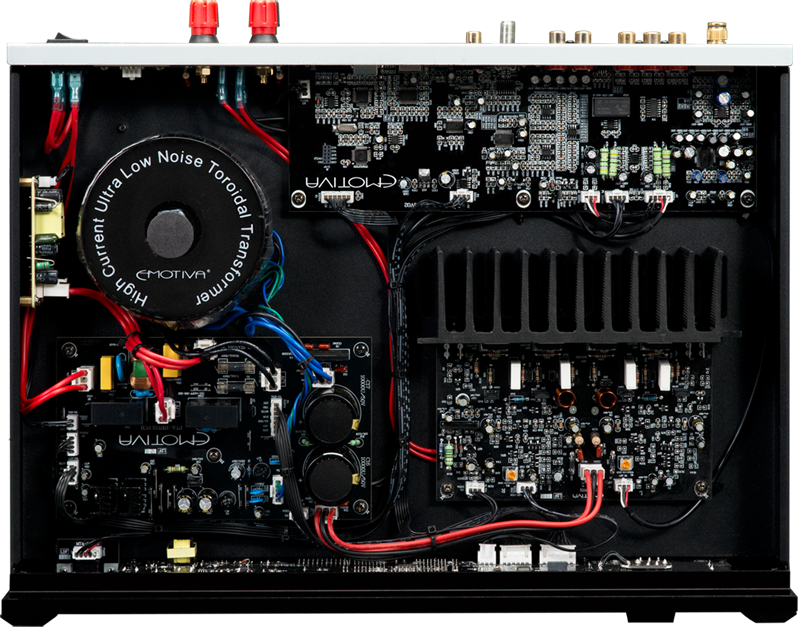 You can build a complete music system out of BasX components that will give you a true audiophile listening experience. Or try adding one or two BasX components to round out your existing audio system. Great sounding audio doesn’t have to be expensive or complicated. - Full complement of analogue inputs including dual line level and a high-quality phono that supports both MC and MM cartridges. - Digital inputs including one 24/96k USB input, 24/192 coax and optical S/PDIF inputs and an optional Bluetooth receiver. - An independent, high current, direct coupled headphone amplifier drives your favourite headphones for personal listening. - Line level main stereo outputs allow you to use the TA-100 as a tuner/preamp with a separate stereo power amplifier. - In addition to the main stereo outputs, a separate pair of summed outputs are provided to connect to your favourite subwoofer. - Unique balance control simultaneously adjusts the levels of both channels so overall sound level in the room remains constant. - The full function remote control operates all the controls on the TA-100 without you having to leave your listening seat.